The German Empire was born out of the aftermath of the Franco-Prussian War and the efforts of the Prussian Prime Minister, Otto von Bismarck. Following years of tension between the two nations, the Franco-Prussian war lasted from July 1870 to May 1871. At the Battle of Sedan, in September 1870, French Emperor Napoleon III and his entire army were captured. The German armies then laid siege to Paris, which capitulated on January 28, 1871. Prussia was aided in the war against France by the North German Confederation and the South German states of Baden, Württemberg, and Bavaria. For the French, the monarchy ended, and a new republic was proclaimed. The subsequent peace treaty awarded the territories of Alsace and Lorraine to the German Empire. 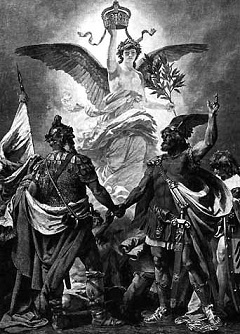 The image at the upper right is the detail of an allegorical painting by Anton von Werner, sometimes referred to as "The Union of North and South", featuring Germania above, raising the imperial crown. The 2 Mark definitive postage stamp of 1900, utilized this motif in its design, accompanied by the legend, "Seid Einig - Seid Einig", meaning "We are United - We are United". The Germanic peoples of Northern and Southern Europe had longed for a national identity, from as far back as the 1600's. Through the machinations of Otto von Bismarck in the 1860's, it actually happened. When Bismarck contributed to the constitution of the North German Confederation, he envisioned a united empire, dominated by Prussia, and was careful to word the constitution of the Confederation, to where it would easily evolve into a new imperial constitution in the future. "We, Wilhelm, by the grace of God King of Prussia, do herewith declare that we have considered it a duty to our common fatherland to answer the summons of the united German princes and cities and to accept the German imperial title. In consequence, we and our successors on the throne of Prussia will henceforth bear the imperial title in all our relations and in all the business of the German Empire, and we hope to God that the German nation will be granted the ability to fashion a propitious future for the fatherland under the symbol of its ancient glory. We assume the imperial title, conscious of the duty of protecting, with German loyalty, the rights of the Empire and of its members, of keeping the peace, and of protecting the independence of Germany, which depends in its turn upon the united strength of the people. We assume the title in the hope that the German people will be granted the ability to enjoy the reward of its ardent and self-sacrificing wars in lasting peace, within boundaries which afford the fatherland a security against renewed French aggression which has been lost for centuries. And may God grant that We and our successors on the imperial throne may at all times increase the wealth of the German Empire, not by military conquests, but by the blessings and the gifts of peace, in the realm of national prosperity, liberty, and morality. [signed] Wilhelm I, Emperor and King." The painting above, by Anton von Werner (1843-1915), is titled "The Proclamation of the German Empire". This is a later version, painted in 1885. An earlier version, painted in 1877, which was a gift to the Emperor, was destroyed during World War II. The main characters in the painting: On the podium, in front, are Crown Prince Frederick, his father, Emperor Wilhelm I, and Frederick III of Baden, proposing a toast to the new emperor. 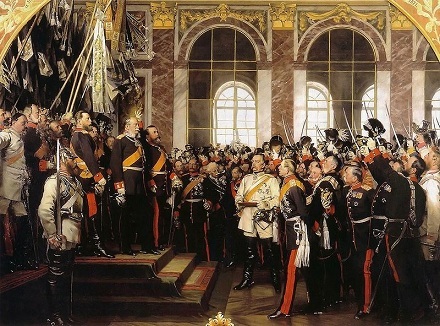 In the center of the painting, in white, is Otto von Bismark, with Helmuth von Moltke, the Prussian Chief of Staff. 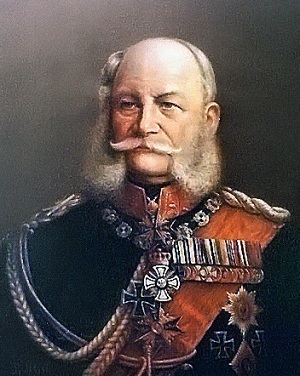 After being crowned emperor in January 1871, Wilhelm I became the symbol of a reborn German sense of unity, and the general public loved him, but his militarism and belief in a divine right brought fierce resentment from some elements of the population, which resulted in a few attempts on his life. The creation of the empire fulfilled a deep wish in German hearts. It gave them a sense of destiny, and with unity, there came an extraordinary upsurge of energy and expansion. During its existence from 1871 to 1918, the German Empire emerged as one of the most powerful industrial economies on Earth.